Oh hey there! I’m back from an amazing trip to Holbox, a little known Mexican island a few hours from Cancun. Holbox was magical, but more on that another time. But what did I enjoy most about our mini Mexican adventure? The food, of course! I’ve come back with a real hunger to learn how to create food like I ate over that glorious week. And my god do I have a craving for one of my true loves, tacos! A few weeks before I left for Holbox I met a friend for tacos at the much celebrated Breddos Tacos to get me in the taco-mood for Mexico. 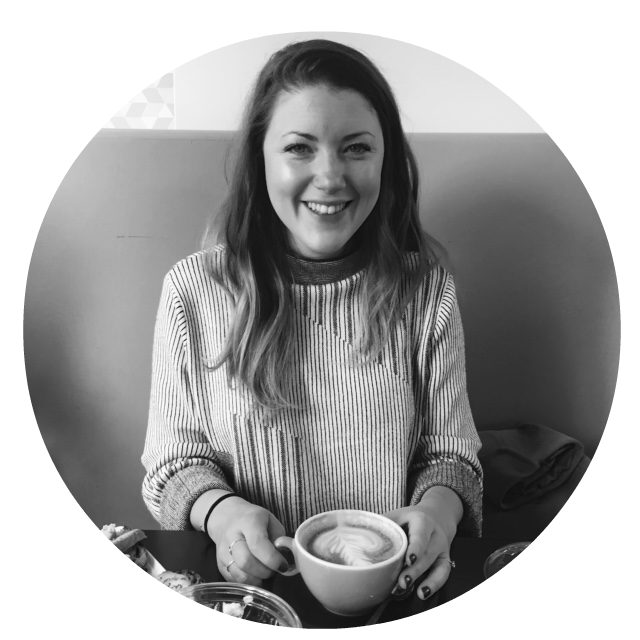 Maybe Holbox is different to much of Mexico because of it’s location, but what I loved was the variety of food and the variety of taco fillings, which is also what you get at Breddos. The menu is so inventive and ever-changing. And it brings in flavours and cooking techniques from across the globe. 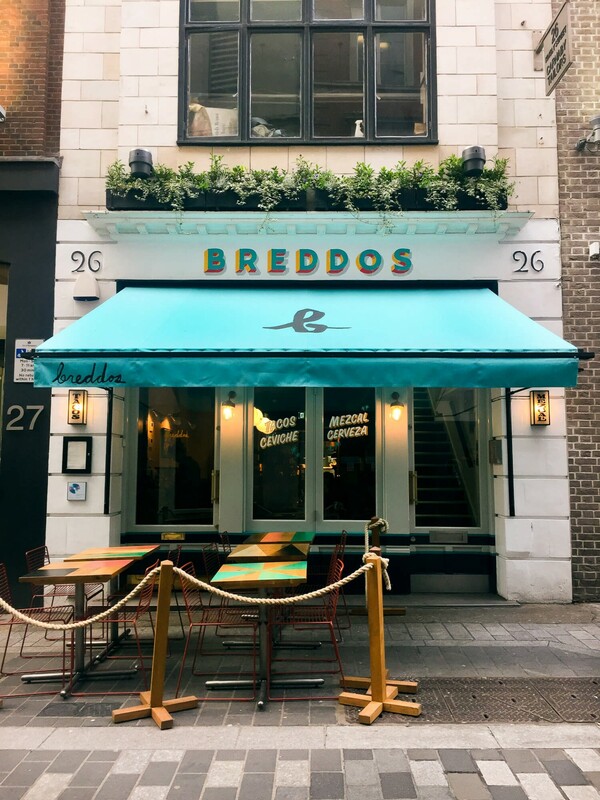 Breddos Tacos is located on Kingly Street, just moments from hectic Oxford Circus and Carnaby Street. The restaurant has been decorated perfectly making it cosy and picture-perfect. I can promise you will want to steal all the beautiful plates and take them home to your own kitchen. The main reason for my visit was for the tacos, but the menu at Breddos Tacos is not just about the glorious taco. Which actually I’m happy to report is a good thing – all the dishes on the menu pack a punch and some are so good we even ordered a second portion! I will instantly become your friend if you like to graze through menus and have no issue with ordering a second round. You know I love a compact menu to choose from. It usually means every dish on there is awesome and that is definitely true of Breddos Tacos. The menu is split into snacks, tacos, large plates, sides and desserts. The menu is designed so you can mix and match your order so you’ll end up with a table full of food that compliments each other. We decided to order from the snacks and the tacos and actually left the larger plates. 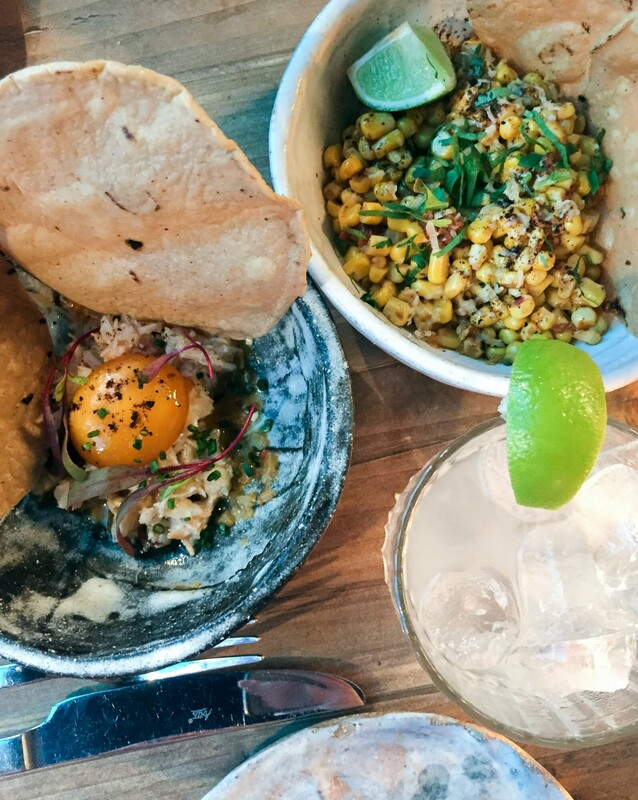 We started with the nduja esuites (pan-fried corn, lime, piquin chile salt) and crab and bone marrow nachos (habanero kosho, cured egg yolk). Now, these were two of the most moreish dishes I’ve had in a long time. So good in fact we ordered another crab at the end of our meal and I’ve been researching how to make the corn at home. 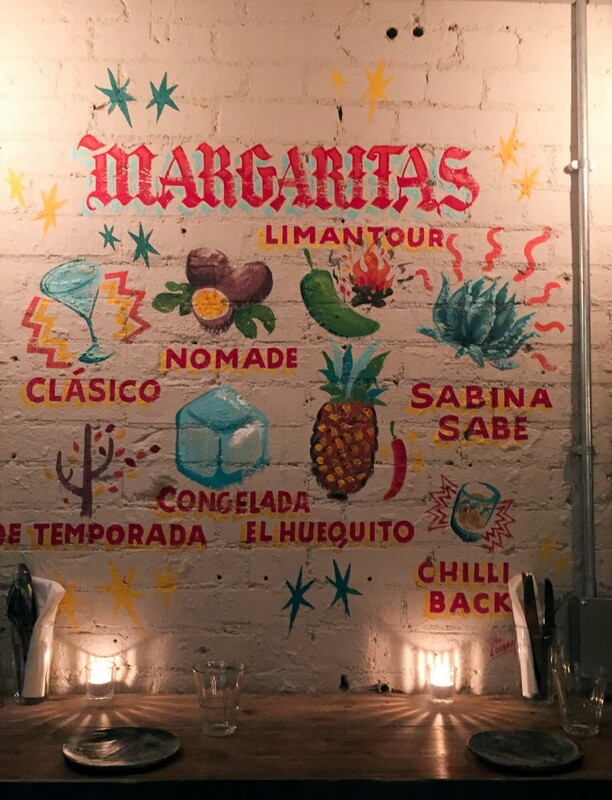 Corn can be boring (although Santo Remedio who have moved to London Bridge do some damn fine corn too!) but I wanted to eat it by the spoonful. The crab dish is small and not so much ‘nachos’ but with two tortilla chips served on the side. 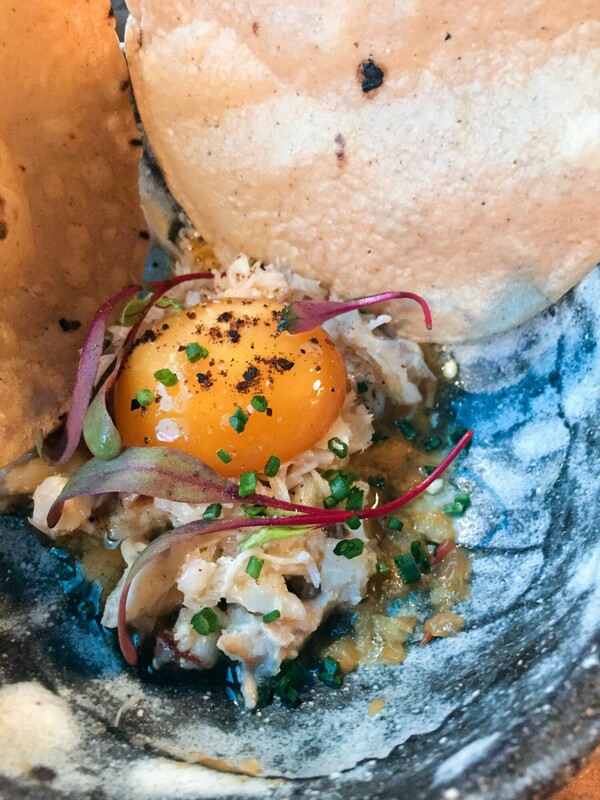 The dish wasn’t as spicy as I thought it would be with habanero, but that yolk was so rich and creamy over the warmth of the crab. It definitely felt like this dish has Asian influence. Now let’s talk about the tacos! We ordered three different tacos: baja fish, masa fried chicken and puebla style lamb shoulder arabes. From reading the menu I thought the chicken with habanero mayonnaise and pico de gallo would be my favourite of the lot. And although I enjoyed the crunchy fried chicken it was nothing on the crisp coated fish with tangy lime mayo. The baja fish tacos were so light! However, the complete surprise was the lamb. 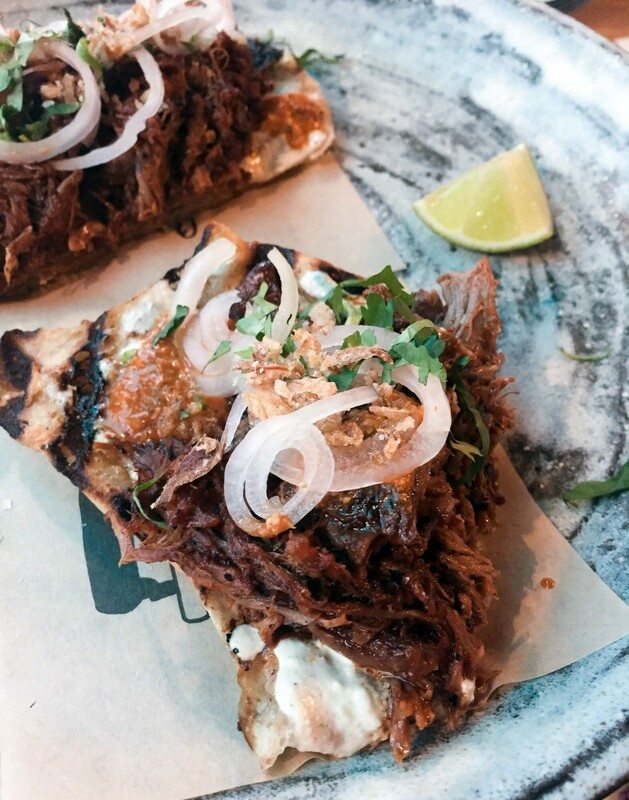 The aromatic pulled lamb is served on chargrilled tortillas and the depth of flavour was incredible. I’m so glad our lovely waitress recommended these. 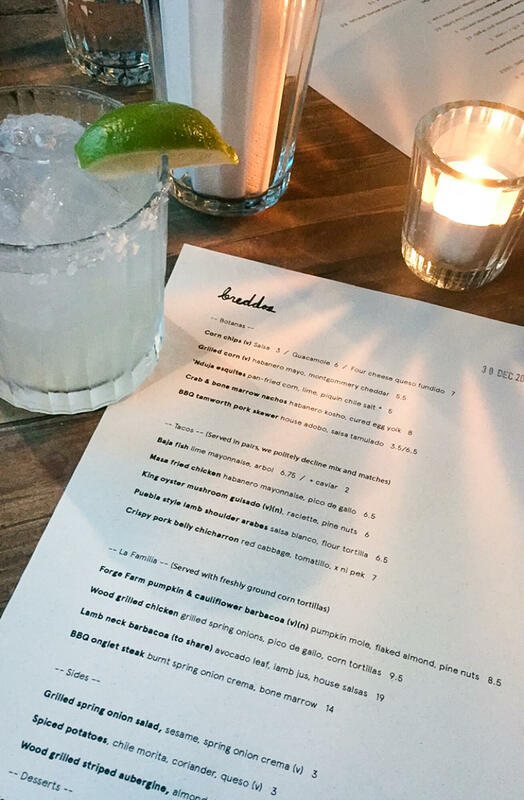 The meal was of course washed down with a few margaritas and mezcal cocktails. The cocktails here are very good. Every taco was presented beautifully: eating at Breddos Tacos is as much a feast for the eyes as it is for the belly. 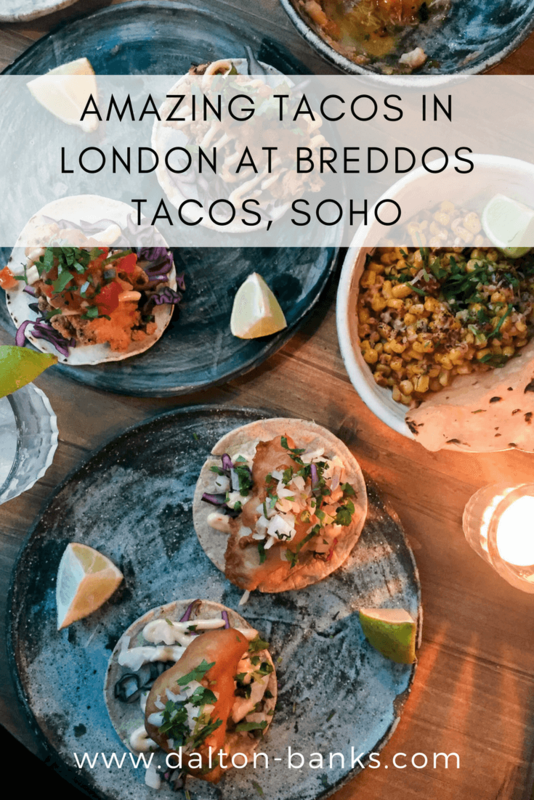 Breddos Tacos serves a menu which is full of vibrant and fresh Mexican flavours, taking inspiration from other parts of the world. If you haven’t been yet, what are you waiting for! 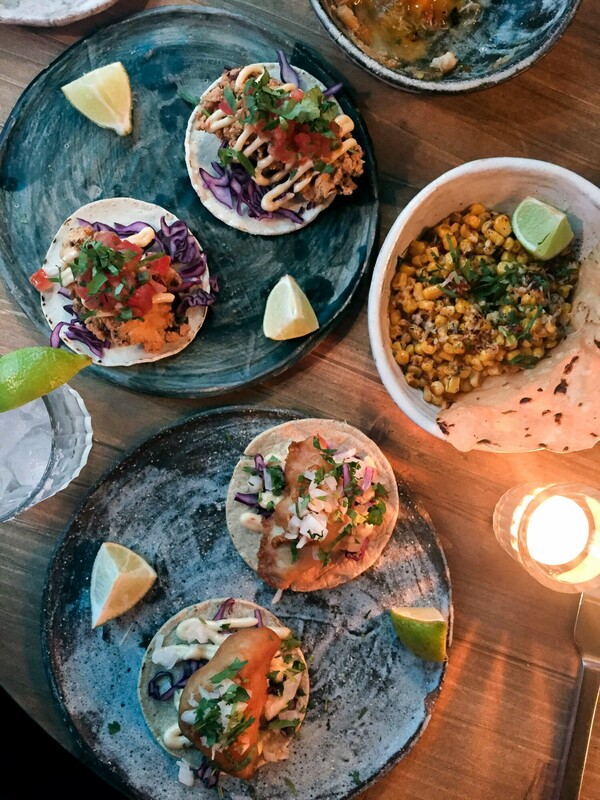 Have you been to Breddos Tacos? 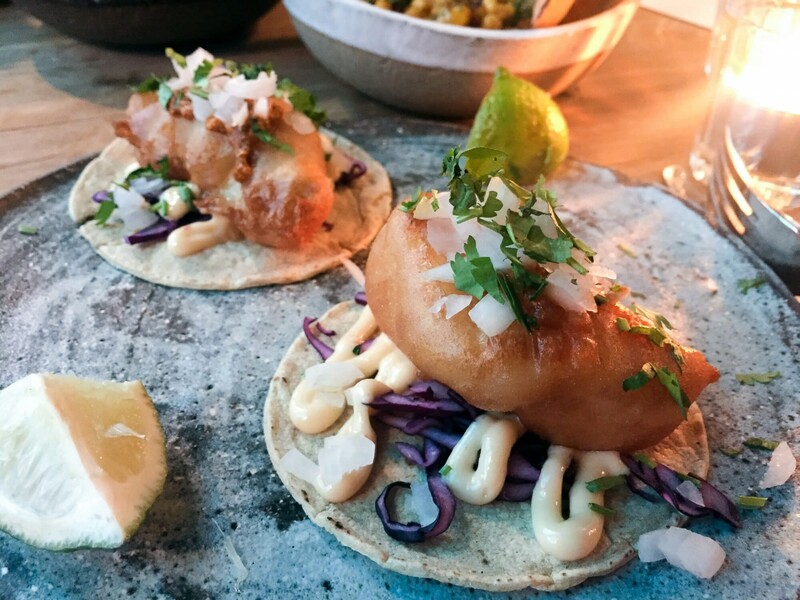 Or do you have another favourite taco joint in London I need to try! ?